Very nice headlamp with the SST-20 95CRI! Is there a way you could put this in other flashlights? Not only does it have very good color rendition, but it throws quite far too. That looks really nice. I just acquired a H03, I would have gotten this if I knew about it sooner. Not a bad price either. I really appreciate there being a high-CRI option. The Samsung LH351D seems like it would be a better fit here though. The SST-20 is very throwy, and the SST-20 version of this has nearly twice the cd/lm of the XP-L version. The SST-20 would be a great fit in some other Acebeam lights, such as the EC35 and the M10. What is sleep/leakage current when lamp is off ? I like the idea. What is the CCT for the SST-20 option? That looks very promising. Getting one as soon as they’re available here. Too bad the lowest mode is a tad high at 5 lumens. I love my Thrunite TH20 (with 3000K XP-L swapped in), which this is a clone of (and the Fenix HL23, but that has no 14500 support and no infinitely variable brightness). This is finally competition in the single AA category, and with the new 1000mAh 14500 cell it has serious runtime too. This would be serious Petzl/H03 competitor if it would have a decent moonlight/firefly sub 0.5lm mode that would nicely substitute for the “loved” red mode of the Petzl headlamps. 5 lumens is simply way too much for preserving night vision. You @Acebeam would sell better if you would listen to the suggestions this community provides for free. But I guess after posting no one will ever look here. Same question. In other words, how long to kill a battery if the light is left turned off? I realize the marketing accounts won’t know this kind of thing. But this really needs to be a 2-way channel that reaches the engineers/designers. This $35 headlamp should span the range from 0.1 to 300 lumens, be available in any tint we demand, be PWM-free, run custom firmware that can easily be reflashed, and we demand a direct line to the engineers who designed this! Then, and only then, will we consider buying it!!! OK, just kidding. But be aware, if posting your lights in a flashlight forum be ready for triggered flashoholics going ape over a 5 lumen ultra-low. I’ve got one in the cart at illumn, just looking for some more stuff to get it up past free shipping. 1xAA headlamps are handy! Thrunite gives you a good low mode. Acebeam gives you a good emitter. Either could do both and immediately become the community favorite. Agreed. I really don’t need anything more in a headlamp than what my Thrunite already provides save a mod or soon to come(?) emitter upgrade…which Acebeam must figure is more than enough to make me forget about a proper low mode. (Edit: one of their distributors made me forget about ‘proper anything’ by offering 15% off through Amazon versus whoever…‘sold’ to an obvious flashaholic). Acebeam, can you confirm if the light has regulated outputs? Just ordered the H40 SST-20 4000K 95CRI from Amazon for $29.80 (no tax and free shipping). I like that the weight is only 34 grams (sans battery). The Thrunite TH20 is over twice that weight (76 grams). 4000K per the Amazon description linked above. Thanks, Al. Good point and price. Not sure who competes at that CRI/output/throw(? )/weight/price point in a headlamp nowadays. Thanks ActiveAl I just bought the same one…..
Woah, thanks for noticing the weight difference, ACTIVE AI! I’m holding off until I hear something about PWM. I don’t care if a light uses PWM but I’ve gotten some budget lights that it’s hard to tell if it’s pwm or a fast strobe. I recommend Eneloops if you can afford them - they have great longevity. This eight-pack of AAs at $18.99 is not too bad. We rightfully complain that OEMs simply don’t ‘get it’ in terms of the most basic of inexpensive features needed to corner a particular market. Immediately, one of their distributors lops off 15% while using a much more palatable and familiar distribution channel…sold. With that said and in my opinion, TH20s will remain the suggested choice for relatively inexpensive/give-it-a-try AA headlamp hosts in an ever changing LED market over but one critical feature…low output. What type of regulation (for example, constant current or voltage) is incorporated into the HC40? Thanks! It will be interesting to see what kind of reply (if any) I get. 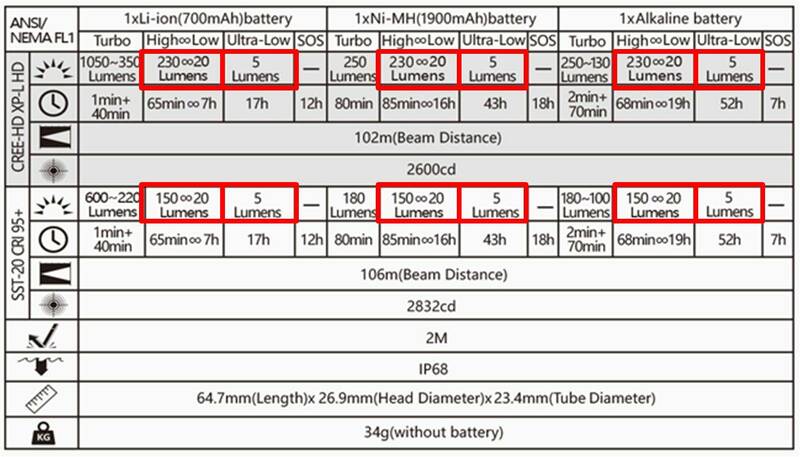 But note the constant lumen output (except in Turbo mode) per LED for all three battery types. Doesn't this indicate some form of regulation? It would be nice to know the specifics. I would keep the significant questions coming until they are all answered in every single thread or expect nothing different. Hmm. This might be my first AceBeam purchase. I love everything about my Nichia Manker E03H except long-press for off. Anybody have both and can compare the two? Edit: It would be nice to have the emitter in the center, instead of offset, better firmware on the AceBeam, and better low modes with a 14500 all look like advantages of the H40 (to me, anyway). And from what I’ve read, AceBeams are generally higher quality builds than most Mankers, right? Well ya’ll talked me into one. I don’t even need a headlamp. I like that the weight is only 34 grams (sans battery). The Thrunite TH20 is over twice that weight (76 grams). I’m skeptical. I suspect Thrunite is giving the weight with the headband and Acebeam is giving the weight without it. Parametrek shows a 1g difference between the two with NiMH battery and headband. …at least you didn’t say (here) that you wouldn’t buy it…and then bought it anyways. I’ll put you down for not needing one because you never had one…just because it sounds better. My Thrunite TH20 weighs 43 grams w/o battery. The headband weighs 33 grams. I PM'd Acebeam and they verified that the 34 gram weight given in their description of the H40 is for the flashlight only - not the headband or battery. So I made a gross error stating that the TH20 is more than twice the weight of the HC40. Sorry if I misled anyone into making a purchase of the H40 based on my mistake. I screwed up. In a separate PM,. AceBeam answered my question about the type of regulation used for the H40. It's "constant current." I have to say that I am impressed at the quick turn around I got from AceBeam on my twp PMs. Looking forward to the arrival of my H40. I will probably end up running it with a Ni-MH battery.